Greyhounds with no teeth are not necessarily a common occurrence but greyhounds with only a few teeth certainly are. 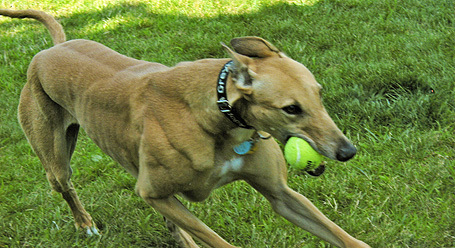 Most greyhounds' teeth will deteriorate as they age. They will get periodontal disease and may need multiple extractions or even may need all of their teeth removed. Extractions are good for your greyhound. Taking bad teeth out will not only make your greyhound's mouth healthy, but it will make your greyhound will feel better overall. Most people, when informed their greyhound needs numerous, or all of its, teeth extracted immediately ask, 'How will my greyhound eat?' The answer, 'Just fine!' During feeding, moistening the kibble will help, but most dogs do not chew their food, they gulp it. Since they don't really chew, they don't need their teeth to survive. If your greyhound needs extractions, we urge you to get them all done and do not wait. Your greyhound will feel, act and play much better. Don't we all want that?